The anniversary of the 1979 Revolution which toppled the Shah’s monarchic regime in Iran, is a reminder of Iranian women’s extensive role and impact in that era which is considered a leap forward in the history of the struggles of Iranian women. 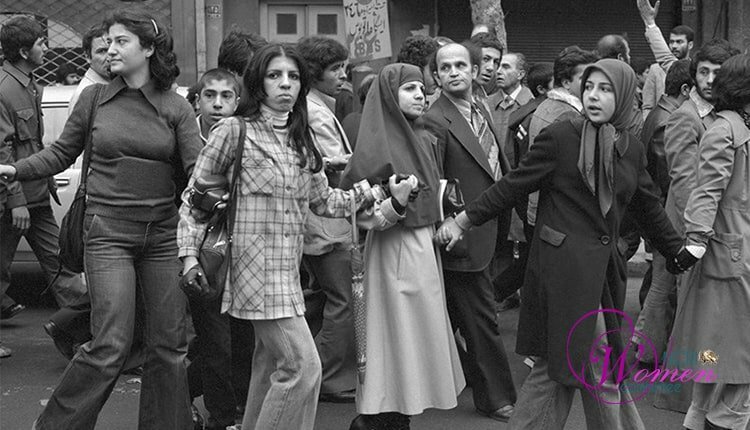 The widespread participation of Iranian women in recent uprisings is reminiscent of their role during the 1979 revolution against the monarchic dictatorship in Iran. The current uprising and the leading role of women in it, is a continuation of their participation in 1979 Revolution and in fact prior to that. Iranian and Western historians who have studied the social and political developments in Iran during the past 150 years attest that the patriarchal historians have often overlooked Iranian women’s heroism, registering and documenting very little. In fact, the very little that has been registered is what dictators or misogynist history have been unable to erase or distort. But even this much speaks volumes about the trailblazing role women have played in Iranian politics, art, and science since the Constitutional Revolution in 1906 and despite various injustices, restrictions and obstacles they faced. The most important indicator of the impact of women as a force of change in any social movement in Iran or elsewhere has been their willingness to be present in the scene and pay a high price including their lives. It is from this standpoint that we look at the anti-dictatorial 1979 Revolution in Iran and the impressive role women played in it. And without a double, that role was influenced by the presence of progressive women in the Mojahedin (PMOI/MEK) and the Fedayeen movements and the social activities of mothers of political prisoners and execution victims of the Shah regime during the 1970s. We look at the lives of two of these leading young women, Fatemeh Amini and Mehrnoush Ebrahimi, who sacrificed their lives in fight against the Shah and became role models for female intellectuals and university students who were willing to make a sacrifice for the change to happen. Fatemeh Amini began her political activities by establishing a progressive women’s organization. After completing her university degree, she started her career as a teacher and was introduced to the Mojahedin (PMOI/MEK) organization. After a 1971 raid by the Shah’s intelligence and military forces on Mojahedin’s bases in Tehran, some 90% of the organization’s leadership and members were arrested and many later executed. After these arrests, Amini took the responsibility of organizing and mobilizing the families of these and other political prisoners to stage protests and activities against the Shah regime. Her activities resulted in her arrest in 1974 and she was taken to the infamous Evin prison for interrogation. Amini was tortured for five and half months. She was flogged all over her body; some parts of her body were tortured with an electrical broiler and as a result she became paralyzed. Amini, however, resisted and did not reveal any information to her torturers, not even her identity. Amini was killed under torture on August 16, 1975. She was the first female Mojahed to sacrifice her life for freedom and equality. Mehrnoush Ebrahimi was a medical student in 1966 when she became acquainted with the Fedayee movement. She worked in a hospital until 1971 before becoming a full-time member of the Fedayee organization and having to go underground. Shortly after, the Shah’s secret agents surrounded and attacked the house where she and another Fedayee member were residing in. Ebrahimi and her fellow Fedayee bravely resisted the attack but were eventually murdered by the Shah’s agents. She was the first female Fedayee to give her life for freedom and equality. In the mid-1970s, the mothers and families of political prisoners and those whose sons and daughters had been executed by the Shah formed the very early core of resistance groups and became known as the “mothers of the martyrs.” These mothers and families maintained a constant presence in the front of the Shah’s prisons to protest the injustices and demanded the release of all political prisoners. Their message of resistance and protest were soon assimilated throughout the society. The final months preceding the 1979 Revolution, saw vast participation of young women and girls in all cities across the country. Extensive participation of female college and high school students in the demonstrations in step with men, gradually attracted the older generation of women, i.e. their mothers, to the protests. This was major stride forward for Iranian women. These women came to the streets and cried out their demand for freedom. The scope of participation by women was unprecedented in the Iranian history until then. In fact, women emerged as a serious new force in the 1979 Revolution who played a remarkable role. Their previously-suppressed potentials had been released. They could not be stopped and were everywhere in step with men. But the 1979 revolution introduced an unanticipated and catastrophic contradiction for women: Iranian women during the 1979 revolution were demanding more freedom and democracy yet the political power, assumed by Khomeini and his super reactionary mullahs, were not only curbing the existing freedoms but gradually introduced new policies to further constrain, contain, and restrict women. Khomeini enforced the new policies via very repressive measures. The new religious dictatorship decided to push women back inside their homes, made “forming families” their primary responsibility and introduced very restrict and mandatory hijab (veil) for all women, including those who were not followers of Islam. Two weeks after the 1979 revolution, Khomeini issued a decree demanding that all family institutions (protective of women’s rights) be closed and laws protecting women be removed. A few days later, he issued another decree to nullify other laws that secured women’s social services employment. One month into the 1979 revolution, the daily Kayhan reported of a “large crowd of thousands of women protesting against forced hijab.” But the peaceful protest was violently dispersed by Khomeini’s fundamentalist supporters. The women’s struggle against forced hijab, segregation and other repressive measures that began in the early days after the revolution became more intensive during the following months. The Mojahedin and other progressive women became very active. They would arrange for book stands on the streets and city squares and campuses to sell and distribute the Mojahedin books and newspapers. They would lock their hands to provide protection for unveiled girls, they would bravely argue and debate policies that restricted the freedoms, and so on. Many of these women and young girls were targets of barbaric attacks by Khomeini thugs. Nevertheless, these women and girls broke many of the social taboos and false beliefs that constrained their freedoms. This generation of women later participated in the June 20, 1981 peaceful demonstration where they were either shot dead or wounded and arrested as Khomeini ordered the Revolutionary guards to open fire on peaceful demonstrators. Many of these women were fatally shot during the protest and thousands more were arrested and later tortured and executed. This time, these women were at the forefront of all protests and resistance, inside the dungeons or outside, something that subsequently evolved into women’s participation in the movement’s leadership. Iran under the mullahs is known for its repressive and systematic measures against women. At the same time, the Iranian women have proven their leading role for demanding and bringing about change. The world has an obligation to acknowledge and recognize that bravery, resistance, and strong character that are so dominantly evident in sounds and images of the recent uprising. Of course, the Iranian women’s leading role in social change and revolution is not a spontaneous phenomenon but it is rooted in the fights and struggles for freedom and equality during the past 150 years. There is no doubt that Iranian women will be the primary force in overthrowing Iran’s religious dictatorship and turning the page of history.